I thought it would be fun to start a new series called "Feathered Friend Friday." The plan is that every Friday I will write a post with interesting facts, photos, or funny stories about chickens. I'm a bit obsessed with my girls, so this is a good way to share my love of all things chicken! If you need to catch up, you'll find all the Feathered Friend Friday posts here. It seems to cool them down and is very good for their digestive systems. And it's hilarious watching them eat it! I've learned to put the bowl down and step back immediately. They go crazy and the yogurt usually ends up all over them and me if I stand too close. 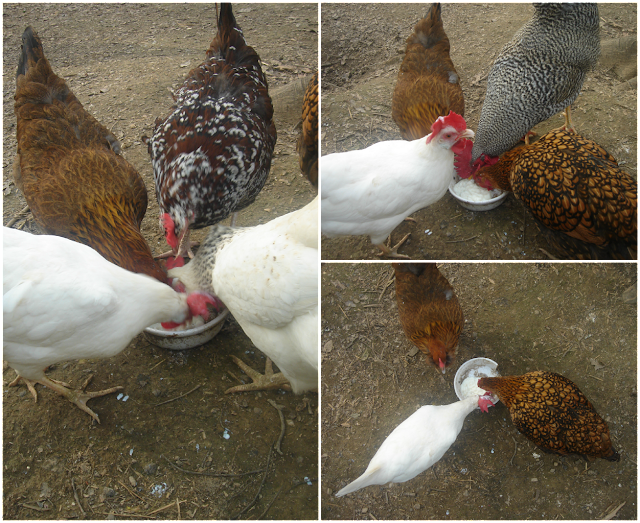 In the wintertime, they absolutely love warm oatmeal (yes, they are somewhat pampered!). Of course they eat up bugs and worms, but I have to admit I was shocked the day I saw them tear apart a tiny mouse. It was kind of traumatic, actually! On several occasions I've seen them with frog legs hanging out of their beaks. That's not a pretty sight to see, either. Takes them a while to swallow. Ewwww. They also like corn on the cob (I give them our cobs after we eat the corn and they peck at them all day long), cooked pasta, sunflower seeds, cabbage and lettuce, beans, strawberries and blueberries, and bread. They also enjoy scrambled eggs oddly enough. Really, there are very few things they don't like!